By day the architecture and landscaping of your home is admired by all who see it, however at night your home and landscape disappear into the darkness. You have made a substantial investment in your home and landscape. Lighting allows you to see a return on your investment day and night! Why not let CityWide Sprinklers turn what you can see during the day into dramatic, romantic or even mysterious scenes come nightfall. 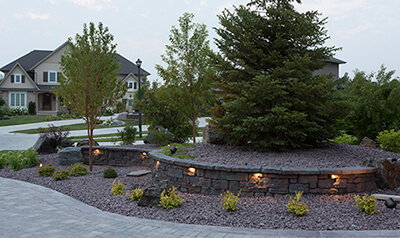 A professionally installed lighting system will beautify and bring life to a landscape that otherwise would appear dark and uninviting. There are many reasons to professionally install a landscape lighting system such as safe passage through your property after dark. Steps, pathways and patios can be lit up. Lighting also adds to a homeowner’s sense of security as intruders are often dissuaded by a well lit home. At CityWide Sprinklers we believe that your yard is an extension of your home and living space. Your patios and pool areas can now be used to safely entertain at night while your guests admire your well lit landscape. As with our sprinkler systems, CityWide only uses professional grade components in our lighting systems, including, although not limited to Unique and Vista Professional Outdoor Lighting. 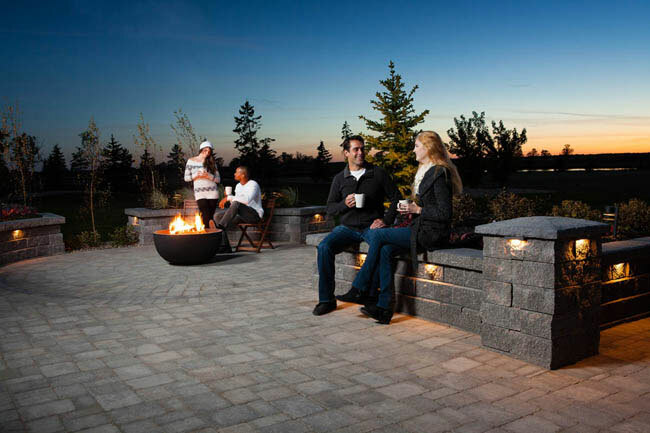 We install all types of fixtures such as accent lights to accentuate key features of the landscape and path lighting to ensure safe passage through your outdoor living space. We also illuminate the walls of stacking stone planters with small brick lights that highlight the interesting textures of the stone.If you have a water feature or pond CityWide offers a variety of underwater lights that will bring it alive and create a unique focal point that will be admired by all who see it. Contact us now and we will show you how amazing your home and landscape can look after dark! CityWide sprinklers also services and maintains existing landscape lighting systems. Whether you require a simple repair, such as replacing a fixture or a complete retrofit of your current system we have the experience to tackle the job. Contact CityWide Sprinklers and we will ensure that your home and landscape is properly illuminated and becomes the envy of the neighborhood! Check out Silver Stone Landscaping for more information about the landscaping featured in the above photos.